OXFORD, Miss. – For two decades, David Pasco has pursued the discovery of plants that can enhance a person’s immune system. Pasco, a pharmacognosist, is a longtime researcher and associate director of the University of Mississippi’s National Center for Natural Products Research and director of the Drug Discovery Core at the University of Mississippi Medical Center Cancer Institute. 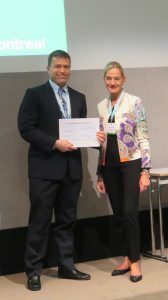 This week, the work of Pasco and his lab was recognized in Basel, Switzerland, when a paper published in September 2016 was named the Most Innovative Paper published that year in Planta Medica, the journal of the Society for Medicinal Plant and Natural Product Research. The paper delves into the bacteria – think probiotics – in echinacea that cause it to enhance a person’s immune system. For years, scientists have pointed to other components of the plant as the workhorse in improving immune function. For the study, Pasco and his colleagues extracted the bacteria found within several kinds of echinacea and let them grow on cell-culture plates. They then measured the bacteria’s ability to stimulate macrophages, a type of cell that helps protect against infections. 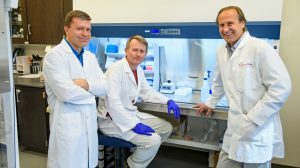 “We found that in echinacea, and in many other plants used for immune enhancement, that components of the bacteria that live within these plants naturally are the main thing that would enhance immune functions,” he said. Work on this paper proved his point: It’s the bacteria, not the host plant’s compounds, that enhance the immune system. That means scientists can measure how effective a supplement derived from a plant will be by counting the bacteria in each sample. The more bacteria, the stronger the immune-enhancing properties. The amount of bacteria accounted for half of the extract’s activity. Pasco and his colleagues found that some groups of bacteria, called proteobacteria, had more activity than others. This means that it’s not only how many bacteria an Echinacea plant contains, but also which kinds. “We identified all the bacteria that were in each sample that could contribute to this kind of activity,” he said. “The bottom line of the paper was if we added up the contribution to macrophage activation of all the different bacteria we found within the plant, we could predict how much activity an extract from the plant would have. For now, Pasco is holding back his excitement on the journal publication and the resulting award. Nirmal D.C. Pugh, NCNPR senior scientist, who worked on this research with Pasco since he was a graduate student, traveled to Switzerland to accept the award. Pasco wants more. He wants to see his work with another immune-enhancing natural product, the blue-green algae Spirulina, used to help cancer patients. The supplement, which contains the same but higher levels of one of these bacterial components, could improve the efficacy of immune checkpoint inhibitors, which are effective for about 30 percent of patients who use them. “When we can demonstrate that this extract has a powerful impact on chemo patients or enhances the effectiveness of checkpoint inhibitors, then I’ll get excited,” he said. Checkpoint inhibitors work by telling a person’s immune system that a cell, such as a cancer cell, is foreign and should be attacked. The product is extracted from Spirulina and has been licensed to a company that is marketing it as a dietary and food supplement ingredient. Experiments in mice show it can reduce tumor load, the number of cancer cells in the body, by 75 percent. UM is seeking development partners for the product in the pharmaceutical or adjuvant therapy markets. The extract already has been tested in humans and successfully boosted several aspects of the immune system. Since chemotherapy and radiation therapy tend to deplete the immune system, having a natural product that boosts it could help patients’ successfully complete treatment. To learn more about the team’s research, read the paper at https://www.ncbi.nlm.nih.gov/pubmed/27286330.